Human Endothelial Cells: Pre-Screened for Angiogenesis & VEGF Signaling - The most commonly used human endothelial cells are Human Umbilical Vein Endothelial Cells, (HUVEC), Human Microvascular Endothelial Cells (HMVEC) and Human Aortic Endothelial Cells (HAOEC). At Cell Applications, select lots of HUVEC, HMVEC, and HAOEC have been pre-screened to demonstrate stimulation-dependent angiogenesis and key endothelial cell signaling pathways (phosphorylation of VEGFR, Akt, MAPK, and expression of Tie2, eNOS, Axl and Etk/Bmx. Other cell types can be pre-screened by customer request. VEGF-Stimulated Signaling in Pre-Screened Endothelial Cells -VEGF receptor-2 (VEGFR-2) is a major VEGF of endothelial cells. VEGFR-2-mediated signaling plays a critical role in angiogenesis, including regulation of proliferation, differentiation, cell movement, and survival of endothelial cells. VEGF-induced receptor dimerization triggers activation of VEGFR-2 tyrosine kinase and autophosphorylation at a specific set of tyrosine residues, which serve as docking sites for downstream signaling components leading to activation of downstream signaling molecules, including phosphorylation of Akt and p44/42-MAPK. 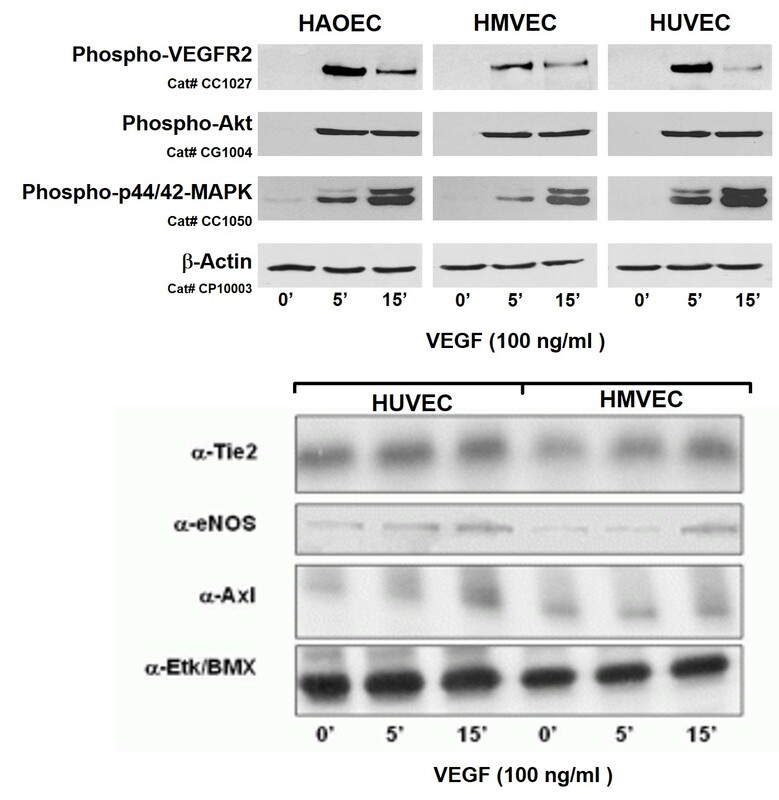 (Click to Enlarge) Pre-Screened Endothelial Cells Top: Activation of VEGFR-2 signaling in HAOEC, HUVEC and HMVEC by 100 ng/ml VEGF for 0, 5 or 15 minutes. VEGFR-2 autophosphorylation probed w/ phospho-VEGFR-2 (Y1175) specific Ab, Akt activation detected by phospho-Akt (S473) specific antibody, and MAP kinase activation detected using phospho-p44/42 MAP kinase (T202/Y204) Ab. Bottom: Pre-screened HUVEC & HMVEC express key endothelial markers Tie2, eNOS, Axl and Etk/Bmx. Etk/Bmx (Endothelial/epithelial Tyrosine Kinase), a member of the Btk family, participates in signal transduction stimulated by growth factor receptors, cytokine receptors, G-protein-coupled receptors, antigen receptors, and integrins, and has been implicated in cell adhesion, migration, proliferation and survival.